Labor Day: Adonai Is Building the House! 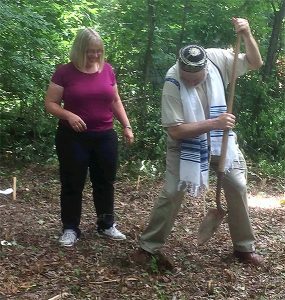 At the Tikkun RESTORE conference last June, I received a prophecy—so powerful it moved me to tears—that Beit Simcha would break new ground. Well, we had a ceremonial groundbreaking last summer. Now I am believing for something involving bulldozers. Soon, Lord! Amen? A bank has given us a verbal YES to financing our new Synagogue and Community House! It is a remarkable sign of God’s favor. The Lord has provided over a million dollars for this project, through generous donations from both within and beyond the congregations. Baruch HaShem (praise the Name) and todah rabbah (thanks so much)! Through the efforts of many people in our community, He has also lowered the estimated cost of the project by over $600,000 compared to what two contractors proposed. Hallelujah! Several banks had shied away from our project. Several said we were too small a congregation to finance such a large project. Let us rejoice that we serve a God who works wonders with the smallest and the humblest. Ah, but there is still much to be done! So far, the bank’s approval is verbal. The bankers required a financial package with many documents, and many people have helped me to put it together. Todah rabbah to Susanita Levy, Nick Negoescu, Tim Basehore, Jordan Hall, Nick Ciccone, and all who have been praying for grace and shalom! I will be meeting the bankers this week. Lord willing, after this meeting, it will take about a month to appraise the property and finalize the official final loan paperwork. Lord willing, I will be able to share more good news about our progress on Erev Rosh Hashanah and my next blog. Lord willing, we will close the loan with the bank in October and … start site work. Now that would be an occasion for celebration! So in faith we’re planning a celebration on October 6, at Leithsville Fire House south of Hellertown, starting at 6pm. While Jordan Hall, a gifted violinist, and our worship team serenade us, hors d’oeuvres will be served. Pastors Larry Burd and Ray Ricketts, long time supporters of our project in faith, prayer and more, will share encouraging words of faith. Everyone is welcome, so please fill out our RSVP to let us know you’re coming. Meanwhile, there is still time to make some adjustments (and improvements) to our pricing as well as for more donations and investments to come in. The harvest is plentiful, but the laborers are few. And the clock is ticking. If we don’t begin construction in October, the ground may become too cold to lay foundations. So please pray for more favor and provision, and prayerfully consider donating or email me at info@beitsimcha.com to inquire about investing in our project at this crucial juncture. Volunteer: We need all hands on deck! Email Jordan Hall (jordanhall@beitsimcha.com) with your skills and availability to help during building construction. Help us spread the word: Don’t miss building project updates from Rabbi Glenn. Sign up to get further updates in your inbox, and share updates with friends and family. The Psalmist (127:1) declares that unless Adonai builds the house, the builders labor in vain. Pray for God’s guiding hand in this process as we continue to forge ahead.